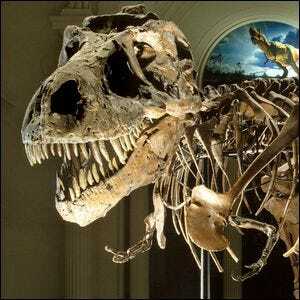 “Sue” Is The Nickname Of The Largest Known Skeleton Of Which Dinosaur Species? If you wander through the great display halls of the Field Museum of Natural History in Chicago, Illinois you’ll inevitably (on account of its sheer size) stumble across quite a magnificent fossil specimen. There in the halls you’ll find Sue, an absolutely enormous and incredibly well preserved Tyrannosaurus rex skeleton with a length of forty feet, a height of thirteen feet (at the hips), and estimated weight (when living) of 6.4 metric tons. Why Sue? Although the dinosaur skeleton is firmly and permanently on display in Chicago, its previous home was the Cheyenne River Indian Reservation in South Dakota where it had died approximately 65 million years ago (long before humans populated the region, that’s for sure). In the summer of 1990, a group of paleontologists were exploring the region and Sue Hendrickson discovered the tail of the huge T. rex skeleton that would go on to become named in her honor. The skeleton, when fully excavated and examined, proved to be the largest, most extensive, and best preserved T. rex skeleton ever discovered. Sue’s trip wasn’t straight from the soil to the museum, however, but involved a lengthy legal battle over the ownership of the skeleton which ultimately ended when the skeleton was returned to the owner of the land (Maurice Williams) who put the skeleton up for auction. There was great concern in the museum community that the skeleton would end up in the hands of a private collector and the Field Museum enlisted the aide of several large U.S. organizations like The California State University system, Walt Disney Parks and Resorts, McDonald’s, and others to secure donations in order to purchase the skeleton for public display. Ten years after the bones were discovered Sue went on display in May of 2000 and has remained a permanent and heavily visited fixture in the museum ever since. Image courtesy of The Field Museum.